This white paper is provided by Curriculum Associates. Check out mathematics expert Dr. Mark Ellis "Knowing and Valuing Every Learner: Culturally Responsive Mathematics Teaching (CRMT)". 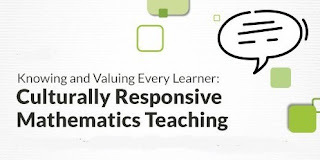 Culturally responsive mathematics teaching (CRMT) is about inviting all students into mathematics as participants because their ways of thinking and reasoning are worth sharing. It’s about ensuring each and every learner not only has success with mathematics, but also comes to see mathematics as a tool to examine the world. Malloy, 1998; NCTM, 2014; National Research Council, 2009; Razfar, Licón Khisty, & Chval, 2009).